BBC One has been named terrestrial channel of the year at the Edinburgh TV festival's annual awards, as BBC Three took the prize for digital networks. 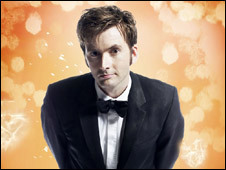 Doctor Who, which has been showing on BBC One on Saturday nights, won the trophy for best programme of 2008. There was also recognition for The Apprentice, as terrestrial show of the year, and comedy Gavin and Stacey, in the non-terrestrial category. The winners were chosen by a panel of TV industry executives and journalists. It was the first time since 2002 that one broadcaster had swept the board, collecting all of the top prizes. And it was the second year in a row that both BBC One and Doctor Who won their respective categories. BBC One had been up against BBC Two, ITV1, Channel 4 and Five for the main prize. And there were nominations for BBC Four, ITV2, Sky One, E4 and Dave in the multi-channel section.